Stark’s Park is Raith Rovers’ home ground. Known as San Starko by fans, the ground lies to the south of Kirkcaldy and was first used in 1891. The main stand – usually occupied on matchday by home fans – was built in 1925. Unusually for a main stand, the L Shaped building hugs the south-east corner rather than being along one side of the pitch. This is due to the angle with which the ground meets Pratt Street. It also houses the club’s administrative offices. The more modern North (McDermid) and South Stands were built in the 1990’s, following new regulations introduced in the wake of a number of crowd disasters. The North stand is where most away fans sit. 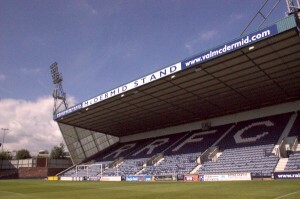 It was renamed the McDermid stand in 2010 in honour of local-born author Val McDermid’s father, who was a scout for Raith. The Railway stand is now unused on matchdays, except for media. Combined, Stark’s Park can hold just over 8,000 seated fans. 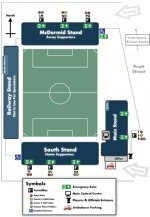 For directions, please click here for a streetview/map of how to reach Stark’s Park from the train station. To see the stands in 360, visit our Virtual Tour.